Chimpanzee Information: Orphaned Bonobos at the Lola ya Bonobo need your help! .The Little Rock Zoo needs to step up and care for the animals better! Please read the several artciles here with deaths, sickness and a bald chimp! 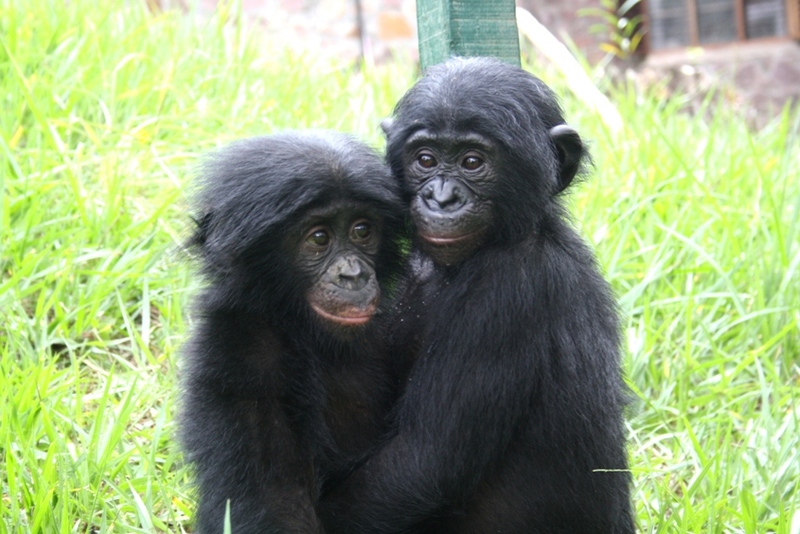 Orphaned Bonobos at the Lola ya Bonobo need your help! We can begin the New Year by telling you that we have now reached 28 000 $ for the new Nursery/Quarantine facility at Lola and it is only early January… we still have all month to reach our target of 50 000$! the bonobos still need you!!! What do monkeys see when they look into a mirror? Where is Ham the Chimpanzee used by NASA now? What is a Bonobo Ape? Zookeeper gets 3 fingers bit off by Chimpanzees. To Louie we love you and may God Bless your soul. To Mikey we love you and hope you will always be happy and healthy. Call your state representative, tell them to Ban Chimpanzees in your state! This past year has been one of sadness, sorrow, change, and hope. I would like to take this opportunity, as we begin 2010, to reflect back and highlight the changes that we now, hopefully, are really beginning to see as the world’s attitude towards privately owned chimpanzees, and primates in general, change in a positive way. The highlights begin, actually, late in the fall of 2008 when our chimps, Mikey and Louie, the two busiest and most popular working chimpanzees in America, retired to Little Rock Zoo. I wanted them to have a future as part of a family of chimps, and to have a safe and permanent home that they could live their life as chimpanzees, not a member of the human society. In November of 2009, Connor and Kramer the chimpanzees owned by private pet owner Jeanne Rizzotto escape from her home near Red Lodge, Montana. They spent over an hour running loose, crossing highways and entering neighbor’s property. Connor, a habitual biter as described in court papers filed after the incident, bites a woman on the arm as she tries to keep him out of her home, losing 6-8 inches of skin from her arm. Rizzotto is told to keep the chimps in quarantine at her home while health officials investigate the incident. Rizzotto claims the chimps were let out by a vandal that had cut a lock, however that remains unproven. All of these articles have been posted on this Simian Library. In February, 2009, tragedy strikes, and the world’s attention turns to the issue of private ownership of chimpanzees. On a cold afternoon in Stamford Connecticut, Travis the Chimpanzee attacks a long time friend of owner Sandra Herold named Charla Nash in Herold’s driveway. Travis is shot and killed by a patrol officer as the 14 year old, 200 pound male chimpanzee; tries to pry open the door of his patrol car as he responded to the tragedy. Nash is rushed to the hospital, and remains in a coma for months. Weeks later, in early March, the US House of Representatives passes the Captive Primate Safety Act, banning sales of all primates across state lines. The bill moves on to the senate, where it still sits, not being acted on, to this day. In late November, 2008, neighbors turned in a couple in Houston, Texas for a chimpanzee living in a garage in a suburban neighborhood. Fred Henry, now known simply as Henry, was over fifteen years old and had been living in the garage in a cage for 15 years. Weighing only 65 pounds, about 100 pounds underweight, the emaciated chimp is taken to the local SPCA where veterinarians and animal officials nurse him back to health. On Feb 23, 2009, Henry is moved to Chimp Haven in Shreveport, LA to live out the rest of his life with other chimps in a safe and enriching environment. Later in March, a chimpanzee named Timmy escapes from his owners’ home in rural Missouri. The owner, Mary Overton, was a former director of The Simian Society of America, a group that promotes and encourages private primate ownership. Timmy is shot and killed by a police officer as he attempts to pry open the door to the officer’s patrol car. Investigators charge all residents of the home with animal cruelty, as they find a “puppy mill” on the premises, with dead dog carcasses scattered throughout the property and over a hundred sick and undernourished animals, including several monkeys. On March 4, 2009 Nightline on ABC airs over fifteen minutes of footage taken by a HSUS undercover worker at the University Of Louisiana Lafayette National Primate Research Center. The video shows acts of cruelty and inhumane treatment of chimpanzees, including scores of baby chimpanzees in a holding cell with no enrichment or even a blanket. The video brings new awareness to the plight of research chimpanzees, and turns up the pressure on the labs. A follow up investigation by the USDA, following the issuance of a 108 page complaint by the HSUS against the lab, reinforces the findings of the video taken. Carole Noon, founder and director of Save the Chimps in New Mexico and Fort Pierce Florida passes away from pancreatic cancer at the age of 59. Noon, perhaps the world’s most famous chimpanzee advocate, founded Save the Chimps in 1997. She led the purchase of the former troubled Coulston Foundation research facility near Almagordo, New Mexico in order to rescue over 250 chimpanzees that had been used by the government for research, mostly from the space program in the 60’s and 70’s. The chimpanzees in her care, now numbering over 270, were being moved from New Mexico to the Florida facility, hailed as the largest chimpanzee sanctuary in the world. Noon left a legacy of care, compassion, and love for the species that will never be duplicated. The chimpanzee community misses her dearly. In June, a news story from a Tampa Florida television station airs a story about a baby chimpanzee now residing at Big Cat Habitat in Sarasota, Florida, home of the Rosaire family of circus trainers. The chimpanzee, named Eli, was supposedly rejected at birth by his mother and is being raised by Kay Rosaire and Gini Valbuena. Valbuena, a long time buyer of baby chimpanzees that once described herself as being “addicted to chimpanzees”, is advertised in the news story as the chimps’ “full time nanny”. The Rosaire’s had a coming out baby shower for the chimp in June, asking the public to donate toys and diapers, as well as pay the price of admission. In early September, Gini and the baby chimp are spotted at a winery in Florida, drinking mimosas and schmoozing with the public. Later in September, “chimpanzee encounters” with the baby chimpanzee and Gini Valbuena, are being advertised on a play for fee basis on the Big Cat Habitat home page. The addiction continues. On December 10, 2009 Tom, a 44 year old chimpanzee that lived the last 14 years at the wonderful Fauna Foundation in Canada, passed away. Tom had been a research chimpanzee for the first thirty years of his life, languishing in a five foot by five foot by seven foot high stainless steel cage. He was the victim of countless laboratory tests, biopsies, injections, and suffering. Tom was the face of Project R&R, aimed at releasing all chimpanzees from biomedical and invasive research, and the driving force behind the Great Ape Protection Act now before Congress. There are still 1400 chimpanzees used in biomedical research in the United States today. On December 17th, 2009, ten more chimpanzees arrived in Fort Pierce Florida as part of the Great Chimp Migration continues. Save the Chimps, the largest chimpanzee sanctuary in the world, transfers ten chimps at a time to the islands in the Florida facility as funds allow. An anonymous donor gave the $25,000 for this trip, and the Arcus Foundation has agreed to match all funds donated to Save the Chimps up until April of 2010. Start your year right – and donate to the Great Chimp Migration today!